I went into The Sleeper not knowing very much. I knew it was an 80’s homage film that was shot independently in Ohio. I bought “The Sleeper” two weeks after it was released on dvd. It’s 1981 and the girls of Alpha Gamma Theta sorority are having a party, but an unexpected guest is watching the girls every move. Making phone calls to the house, peering through windows, walking around the house, to even sneaking in. This movie definitely pays tribute to the original Black Christmas, John Carpenter’s Halloween, Prom Night (dance scene in “The Sleeper” = AWESOME), and The House On Sorority Row. I loved this movie! The director, Justin Russell captured everything that was perfect about 80’s horror. I knew exactly what Justin was trying to accomplish the minute the film started. It is very obvious that he is a HUGE fan of the genre and it shows. Everything from the opening score, the look, atmosphere, and of course a nice body count. Congratulations for succeeding Justin. The acting in “The Sleeper”, I would say is top notch. Mr. Russell did a great job on the casting. All of the girls are likable in their own personal way. Our lead, Amy (Brittany Belland) does a great job. She is very pure and we want to see her survive in the end. The killer aka “The Sleeper” (Jason Jay Crabtree) looks and acts the part. He reminds me of the killer’s from He Knows You’re Alone, and The Slumber Party Massacre. Like both of those killers, he gives the wide-eyed looks, creepy voice, and his overall body language and movements. Mr. Crabtree knocked it out of the park with a home run! great person, friend, and filmmaker. Keep on doing what you’re doing Justin! Check out “THE SLEEPER” tonight! Highly recommended! As I read that synopsis on IMDB, I knew to myself that I had to find this movie, “The Sleeper”, and so I spent the next month of my life hunting down this homage to the 80’s slashers that I hold near and dear to my heart. As I received my dvd for “The Sleeper” from Amazon, I ripped off the shrink wrap and threw the dvd into my player. Would I be disappointed like I have been with so many other 80’s slasher homages (“Frat House Massacre” and “Psycho Sleepover”…I’m looking directly at you) or would this be the rare slasher homage that actually works and take us back to a more innocent time? Well my dear slasher fans, “The Sleeper” is a hoot from beginning to end. The deaths are graphic and over-the-top in the best ways possible and the direction and screenplay by Justin Russell is pitch perfect. As I watched this film, a smile grew on my face. I saw the references to “Halloween”, “Friday the 13th”, “Slumber Party Massacre”, and “Black Christmas” and appreciated them more than I can possibly let on. This was made by someone who loves and cherishes the slasher genre and that heart and soul is in every frame of the film. Sure, the movie isn’t perfect. There are far too many characters and some of the acting is a bit flat, nonetheless, those same criticisms applied to even the best of the 80’s slasher films. 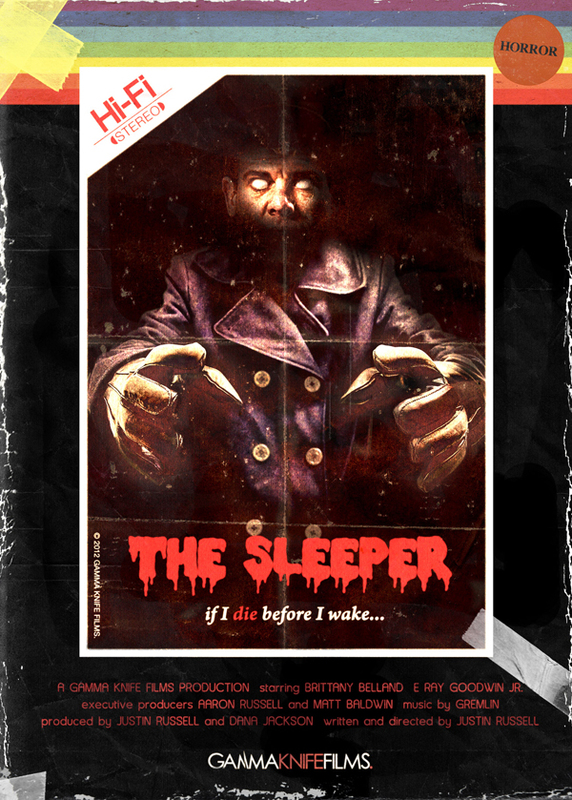 Do yourself a favor and check out “The Sleeper”. If you enjoy horror homage at its finest, you will have a blast. I cannot wait to see what Justin Russell has planned for us slasher fans next.